Gestational diabetes is a frightening thing to experience. Many women are so focused on dealing with the day-to-day aspects of it for themselves and their babies to even contemplate life after gestational diabetes. Do you go back to the way you were doing things before? Or, is necessary to make changes now in order to avoid type 2 diabetes in the future? The truth, is usually somewhere in the middle. 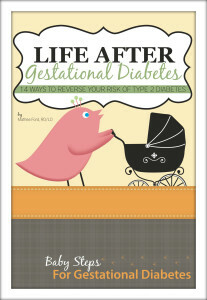 Keep these things in mind as you consider life after gestational diabetes. Women who have gestational diabetes are, statistically, more likely to develop it later in life. It may be related to commonalities in symptoms between gestational and type 2 diabetes and a side effect of dietary and fitness habits. The fact remains, though, that your risks are greater if you don’t make significant, habitual changes in the way you eat. The positive habits you develop while managing your gestational diabetes will help you keep your blood sugar stable during life after gestational diabetes. It really doesn’t get much better than that for anyone attempting to avoid developing full-blown diabetes later in life. Even during your life after gestational diabetes, it’s critical to lose weight, at least some, if you want to prolong your good health, and prevent type 2 diabetes from becoming a major factor in your future. The good news, though, is that you don’t have to take off a lot of weight. Loosing as little as five percent of your body weight can have a profound impact on your overall health and for stabilizing your blood glucose levels — especially when done in conjunction with a diet that is blood-sugar friendly. It doesn’t take a lot of fitness, either, to accomplish your health and fitness goal for a full and healthy life after gestational diabetes. In fact, 30 minutes per day or less of physical fitness is the perfect start. It doesn’t have to be strictly dedicated to boring exercise routines either. You can spend that time taking the stairs instead of the elevator at work, parking farther away at the grocery story, window-shopping at the downtown mall, chasing your children around the yard, climbing trees, dancing, gardening, doing household chores. It’s about moving, adding a little bit of pep to your step, and getting your heart rate up more than anything else. What can you do to get your blood pumping that doesn’t feel like boring old exercises? Life after gestational diabetes is just that, life. You get out of it what you put into it. Don’t spend it pining over the things you shouldn’t eat or drink. Focus on the wide world of foods and drinks that are available to you and make the most of every moment you have with your precious little one. That is what really makes life after gestational diabetes so very worthwhile. Suggested Further Reading View This Book!